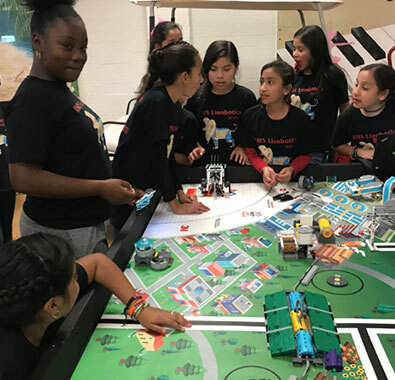 Compton Unified School District in California received a 2017-2018 FIRST® STEM Equity Community Innovation Grant to provide greater access to STEM pathways to underserved and underrepresented students by expanding its robotics programs in 20 elementary and middle schools. We’ve seen tremendous growth in our students. At a qualifying tournament, the boys FIRST® LEGO® League team from Roosevelt Middle had a terrible opening round. Their cables had fallen out of the motor controlling one of the wheels, so the robot would not do anything correctly. After the round, the boys were very dejected. However, the girls FIRST LEGO League team from Roosevelt came over to them and cheered them up. They helped them fix the problem, and then they inspired them to stay strong and make the most of the rest of the tournament. As it turned out, the boys team scored well the rest of the day and then, to their surprise, won first place Core Values and an automatic advancement to the regional championship. Many of the young people involved in the program had never been exposed to LEGO® before, but by the time Christmas came, a teacher at one of our FIRST® LEGO® League Jr. schools told me that nearly all of her students were asking for LEGO bricks on their Christmas lists. Knowing that many students — at this school and probably others — were spending their time at home designing and building their own creations brought me a smile. Learn strategies Compton Unified School District and other high-poverty schools are using to bring hands-on STEM programs into their classrooms.